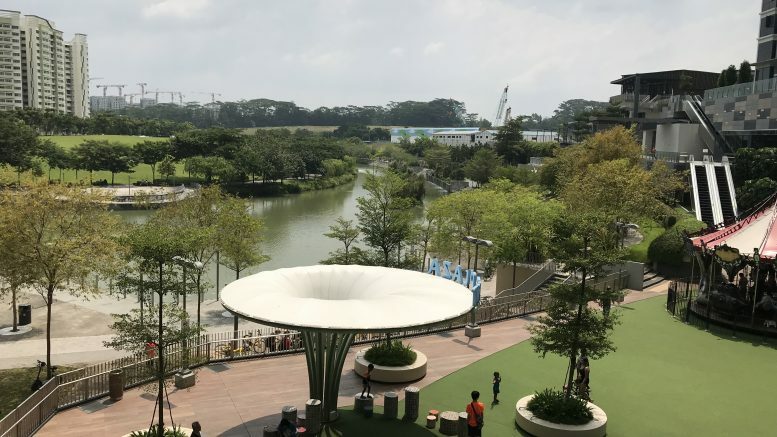 View from Waterway Point mall at Punggol New Town in Singapore. Singapore’s shares may rally at the open on Wednesday, tracking gains in early Asia trade after Wall Street’s surge on Tuesday following strong economic data. “Equity investors took their cue from the industrial production report which indicated inflation isn’t picking up, triggering another Goldilocks economy rally,” Stephen Innes, head of Asia Pacific trading at OANDA, said in a note on Wednesday. U.S. industrial production rose 0.3 percent in September, slightly higher than a Reuters poll forecast for a 0.2 percent rise. But others pointed to the cloud behind the silver lining. The number of U.S. job openings rose in August to a record of 7.14 million, the highest since the data began to be tracked at the end of the Clinton administration and higher than the number of unemployed, while the “quits rate,” or people who voluntarily left their jobs, remained at a 17-year high of 2.7 percent. “The soaring job openings data show that an increasing labor shortage may soon be one of the biggest risks to the economy’s continued expansion. If the trade wars and tariffs are being done to bring factory jobs to the U.S., the Trump administration seems to be behind the times,” Chris Rupkey, chief financial economist at MUFG Union Bank, said in a note on Tuesday, U.S. time. “Companies need more workers than the economy has to give and this is going to lead to a slowdown in economic growth,” he said. Japan’s Nikkei 225 was up 1.27 percent at 8:10 A.M. SGT, while South Korea’s Kospi tacked on 1.57 percent by 8:16 A.M. SGT. Singapore’s Straits Times Index ended Tuesday down 0.38 percent at 3034.31; October futures for the index were at 3034 on Tuesday, while November and December futures were at 3037 and 3034 respectively. Hong Kong’s Hang Seng Index edged up 0.07 percent to 25,462.26, while China’s CSI 300 shed 0.82 percent to 3100.974. Hong Kong’s market will be closed on Wednesday for a holiday. Indonesia’s IDX Composite index ended up 1.28 percent at 5800.82, while Malaysia’s KLCI added 0.47 percent to 1736.84. The Dow Jones Industrial Average jumped 2.17 percent to 25,798.42, the Nasdaq Composite tacked on 2.89 percent to 7645.489 and the S&P 500 advanced 2.15 percent to 2809.92. Futures for the three indexes were nosing downward in early trade. The U.S. dollar index, which measures the greenback against a basket of currencies, was at 95.09 at 7:45 A.M. SGT after spiking as low as 94.80 during the session from as high as 95.20 early on Tuesday, according to ICE futures data. The 10-year U.S. Treasury note yield was at 3.164 percent at 7:58 A.M. SGT from as high as 3.176 percent early on Tuesday, but up from as low as 3.154 percent during the session, according to Tullett Prebon data. The euro/dollar was at 1.1577 at 8:03 A.M. SGT after trading in a 1.1563 to 1.1622 range on Tuesday, according to DZHI data. The dollar/yen was at 112.347 at 8:05 A.M. SGT after trading in a 111.70 to 112.339 range on Tuesday, according to DZHI data. The dollar/yuan ended Tuesday at 6.9101 after trading in a 6.9052 to 6.9258 range on Tuesday, according to DZHI data. The dollar/Singapore dollar was at 1.3739 at 8:06 A.M. SGT after trading in a 1.3724 to 1.3781 range on Tuesday, according to DZHI data. The dollar/Indonesia rupiah ended Tuesday at 15,195 after trading in a 15,170 to 15,233 range during the session, according to DZHI data. The dollar/Malaysian ringgit was at 4.1475 at 8:05 A.M. SGT after trading in a 4.1496 to 4.1550 range on Tuesday, according to DZHI data. Nymex WTI crude oil futures for November were up 0.36 percent at US$72.18 a barrel at 7:28 A.M. SGT, while ICE Brent crude oil futures for December were up 0.78 percent at US$81.41 a barrel at 5:58 A.M. SGT, according to Bloomberg data.